Looking for a new way to get out and about with your baby? 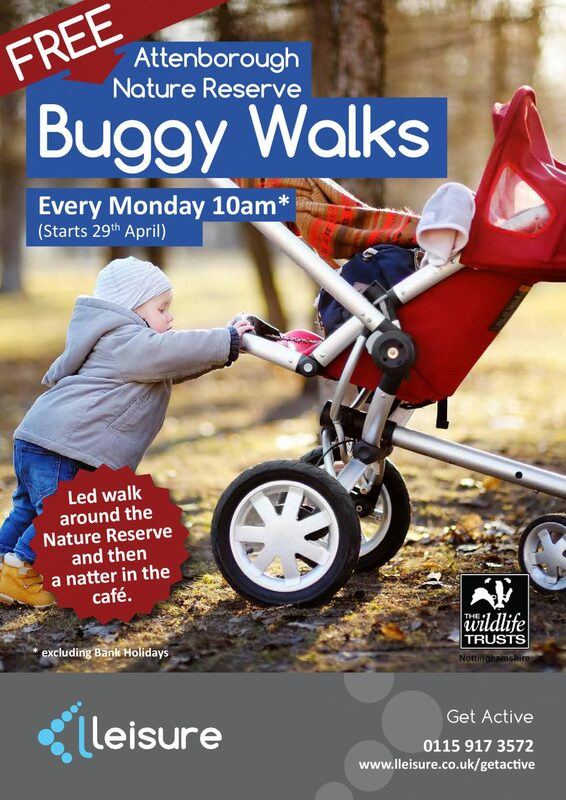 L Leisure are pleased to offer buggy walks starting this spring at Attenborough Nature Reserve. So, what is a buggy walk? It is a free walk lead by a trained walk leader that is suitable for buggies and pushchairs. The walks follow a flat route and are suitable for all abilities, so whether you are new to exercise or not, there will be a pace to suit you. It’s a great way to get outside, meet new people and enjoy some gentle exercise. What’s better is there’s no need to book a babysitter; bring your baby with you while you get some exercise. Our walks are a free, sociable way to make new friends and explore your local nature reserve. The walk will last around 45 minutes to one hour to give you plenty of time to have a chat and socialise with other parents and carers, but you’re welcome to join us in the café afterwards to carry on the chat. If you’d like to give it a go, just meet by the picnic benches near the visitor centre at 10am every Monday (excluding bank holidays.) There’s plenty of parking available in the car park and the centre is easily accessible via public transport. The Trent Barton Indigo bus service from Nottingham and Derby city centres or Attenborough train station is just a five minute walk away. If you are looking for more opportunities to exercise with your baby, check out the bring baby exercise classes at Bramcote Leisure Centre where you can bring your baby in a car seat while you exercise.